On Saturday, June 10th, San Pedro High School (SPHS) held its 46th Commencement Exercises at the R.A. Nuñez Auditorium. 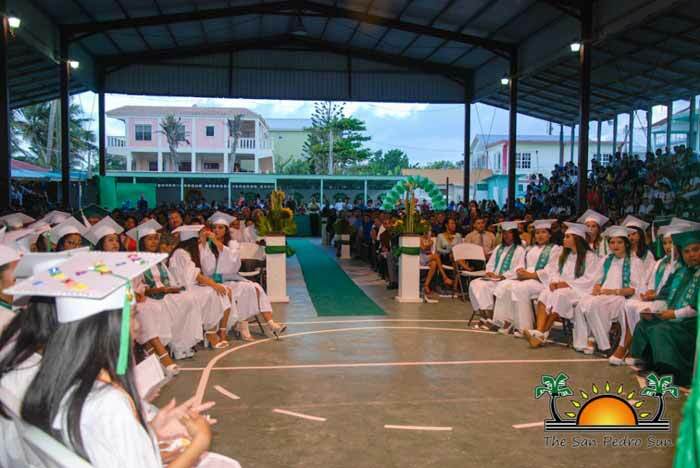 A total of 99 students marched in to the tune of Pomp and Circumstance, eager to receive their high school diplomas. Aliny Ventura and Jahson Wright were the Mistress and Master of Ceremonies. After singing the National Anthem, the graduates sang their school song. Angela Luna delivered the salutatory welcome address, reflecting on her personal accomplishments, and congratulating her classmates for reaching this long-awaited milestone. Vasquez was proud to announce that for the first time in history, SPHS Class of 2017 produced four valedictorians: Aliyah Elliot, Jennessa Sierra, Itzel Kotch, and Chelsea Zetina. “When students work hard, and the competition is intense, it is not unusual to end up with more than one valedictorian. I only remember once when we had two valedictorians. In 2017, we made history with four national championships, and we also made history by having four valedictorians. When we averaged eight semesters, these four young ladies ended up with an identical grade point average of 3.82,” said Vasquez. All valedictorians was given an individual award to highlight their academic achievements.